Property Size 1,584 sq. ft. 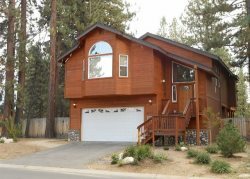 The home is in the gated Tahoe Meadows area, a nice private, quiet spot with lots of open space and natural area's. Tahoe Meadows is an oasis in town, a private gated area, but still very close to the casino area and gondola. Great cabin location just 2 blocks to the beach! Tahoe Meadows has a beach area just for resident/guest use. The cabin is set among towering Jeffery Pines, big back deck with gas BBQ (summer) to enjoy the beautiful Tahoe days.